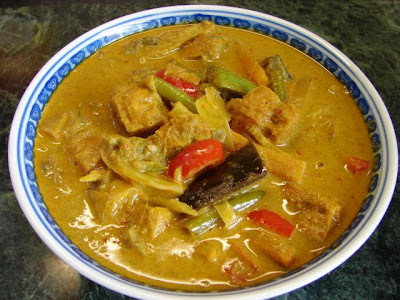 Sayur lodeh is a Malaysian/Indonesian spicy vegetable stew. This is not strictly vegetarian because of the fishy ingredients like dried shrimps and shrimp paste to give the curry stew its unique savoury taste. I love to cook it the Nyonya style with some fried tofu. I always cook a big pot and save some for freezing. This stew is actually better left in the fridge the next day. This is my recipe. See this slide show. Ingredients: Quantity is quite a lot will feed 6 - 8 people. Can reduce to suit your needs. 10g (about 6) large dried chillies - more chillies if you like it hot! Spices not ground: These are not blended into the spice paste because they are fibrous and can be difficult to blend, giving the curry a rough fibrous gravy. * Aubergine - use only freshest aubergine. If it has been sitting in the fridge for over 5 - 6 days, it will be very tough to cook and could be bitter spoiling the curry stew. Same with courgette, old courgette can taste bitter too. ** You can mix and match any vegetables you like, other vegetables like cauliflower, potato, onion, butternut squash, pumpkin etc.... Tempeh is great for this stew. Soak the dried shrimps just covering with water. Leave this to soak for about 15 min. Remove seeds from dried chilli, cut into small pieces and soak with warm water till softened. Drain. If using Malaysian belacan, dry roast in a dry hot pan for about 2 minutes each side. If using Thai shrimp paste, just use as it. Peel the shallot and garlic and de-seed the fresh chilli. Cut everything into small pieces. Put all the rempah ingredients with the dried shrimp soaking water in a small blender or food processor, blend till very smooth. Add a bit more water if you need to make sure the machine is running smoothly. Trim the lemongrass, bash to bruise them. Clean and cut into small pieces. Using a wok or very large saute pan, fry the spice paste with oil and 1 heap tsp of salt for about 10 minutes at medium low heat till the paste is fragrant and oil is beginning to split around the side. Stirring most of the time to avoid the paste sticking to the pan or wok. Add in the cabbage, carrot and aubergine. Also add in galangal and lemongrass. Stir fry for about 4 - 5 minutes without adding water till the vegetables have softened. Add in the beans, okra and fried tofu. Stir fry for another few minutes without water. Add in about 1.5litres of water to cover all the vegetables. Bring this to the boil. Then simmer for about 20 -25 minutes. Then add in remaining vegetables. Simmer for another few minutes till all the vegetables are tender. Then add in 1 tin of coconut milk. Season with some sugar, salt (or fish sauce) to taste. Fish sauce is not a common ingredient for sayur lodeh but I find it tastes better than salt. Simmer the curry vegetable stew for a little while longer. Check the thickness of the curry gravy, thin it down further with water if you like a thin soupy gravy. If more water is added bring this up to boil again, then it is ready to eat. I like the gravy not too thin. Note: Whatever vegetables you like to use, add in the toughest or longest to cook vegetables first and tender ones last. Adding a handful of salted fish bones in part 2 of the cooking process will totally change this curry flavor for the better. Yes but salted fish bones are not something easily available in western countries.